First, I would like to thank OGN, Team Liquid, KeSPA, the fans, the players, and everyone else who has made Brood War the most awesome game in the history of ESPORTS. Professional Brood War in Korea, for most of us, has been a very enjoyable ride. However, the time has finally come to say goodbye. Since 1999, OSL has provided entertainment at the highest level to ESPORTS fans everywhere with games that we may never forget. Tving OSL was no exception. With the event surrounded by the hype whipped up by the "last BW OSL ever," there was a lot of pressure from the community to produce exciting games, and the OSL delivered. We saw some of the most exciting games of the year, played by the best players in the game. Tears were shed and, much as some might wonder why it has to come to a close, it seems that all good things must come to an end. To those of you who have waited so long for this writeup, please excuse us the delay. It was not borne of lassitude, but of a sort of shocked inaction. Those of us who have dedicated our spare time to writing about the game we love so much for all these years found ourselves unable to internalise the knowledge of its having ended, and the result was a sort of grief-addled paralysis from which no final-post could emerge. Though we have yet to shrug off that weighty sense of loss, we have done our best to describe the closing of the OSL here. 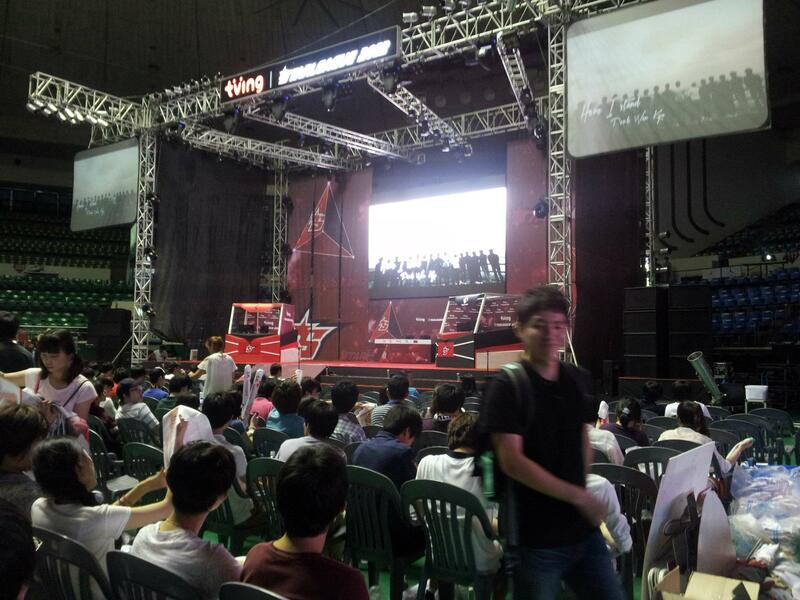 OSL will be played in StarCraft II starting with the Auction OSL. Will OS2L be a worthy successor to the greatest StarCraft league of all time? Only time will tell. Some say that, one day, Brood War will rise again. Until then, here's to the last article on Professional Korean Brood War League on TL. Jangbi starts at 7 o'clock as purple Protoss and Fantasy starts at 11 o'clock as the teal Terran on Neo Ground Zero. Jangbi, thinking that Fantasy will play standard in the first set, makes a nexus at his natural before his gateway. Fantasy, as Jangbi expected, does a standard barracks double. Jangbi quickly gets two gateways and cybernetics core to catch up in tech. Fantasy gets a really quick comsat station and even sneaks an SCV into Jangbi's main to prevent any strategic all-in while getting dropships. Jangbi builds scouting pylons since he knows that Fantasy's specialty is vulture drops. Jangbi also gets a quick third base, harassing with dragoons at the same time. Seeing that seige mode is coming late for Fantasy, Jangbi's suspicions of incoming dropship play cement themselves into certainties. Jangbi fends off Fantasy's drop flawlessly and gains a significant lead over Fantasy. Jangbi decides that he is far enough ahead that carriers will seal the deal. Fantasy tries another cute drop, but that too is shut down in short order. Jangbi begins carrier production, and Fantasy moves out as soon as he scouts the carriers. Jangbi decides to attack Fantasy's main instead of engaging the army and cut off goliath support while clearing the main army with his carriers. With goliaths fighting the ground army and tanks and vultures dying to carriers, Fantasy is unable to do anything but GG once Jangbi's army streams in. Jangbi starts at 1 o'clock as the purple Protoss and Fantasy starts at 11 o'clock as the orange Terran on New Sniper Ridge. Fantasy decides on a standard opening again with barracks double. However, Jangbi decides to mix it up going one-base dark templars. Jangbi expands as he sends his dark templars out but Fantasy's turret is already up. Jangbi realizes he is behind and dark templars are not going to work, so he gets a robotics bay as he establishes a quick third. Fantasy decides to take his time, picking up his own third at 12 o'clock and making his way towards Jangbi's base. Jangbi techs up to arbiters in an effort to prepare for the inevitable push. Fantasy continues to harass with vultures with little success as his tank force accretes. Jangbi takes this opportunity to take a fourth base and keep up with Fantasy's macro. However, he is forced to split his dragoons and Fantasy kills off a fair portion of them with vultures alone. Both players stay passive for a while until Fantasy decides it's time to push out with his army. He sends a group of vultures to Jangbi's fourth to drag Jangbi's army there, and then pushes out with his main army. Fantasy finds a foothold outside of Jangbi's main, while the Protoss army is still returning from the fracas at his fourth. Awesome fight for Jangbi, but is it enough? With sterling arbiter use, Jangbi manages to kill a lot of Fantasy's tanks, but Fantasy reinforces in time for stasis to wear off. Fantasy continues his siege and Jangbi proves unable to push back a second time, and conceding the game. Jangbi starts at 7 o'clock as the yellow Protoss and Fantasy starts at 5 o'clock as the red Terran on Neo Electric Circuit. Fantasy decides to take gamble this time, going fourteen CC. Jangbi scouts it late, but builds a proxy robo in an effort to end it early on one base. Fantasy scouts the proxy robo, but Jangbi's shuttle finishes when Fantasy only has one tank. Jangbi drops his dragoons and zealot into Fantasy's main, killing the tank. Fantasy, who had only been thinking about reavers, lost all of his tanks even before the reaver came. Having taken that early damage from the dragoons, Fantasy is unable to set up defense for the reaver. The shuttle/reaver combination bounces between Fantasy's bases, killing anything in sight. Jangbi gets a second reaver and breaks into Fantasy's main with dragoons. Fantasy waits another two minutes for no reason before typing GG. Jangbi starts at 5 o'clock as the yellow Protoss, and Fantasy starts at 11 o'clock as the green Terran on Gladiator. After the fiasco the last game had become, Fantasy opts to play safe, getting a factory before expanding. Jangbi, not knowing this, goes for two-gate dragoon aggression to seize an easy victory. Realizing that he can't win outright with the dragoons, he techs to dark templars once again. Fantasy gets mines, but Jangb has managed to stem all scouting. Fantasy tries to scout with a vulture, but it only sees a probe in the natural. 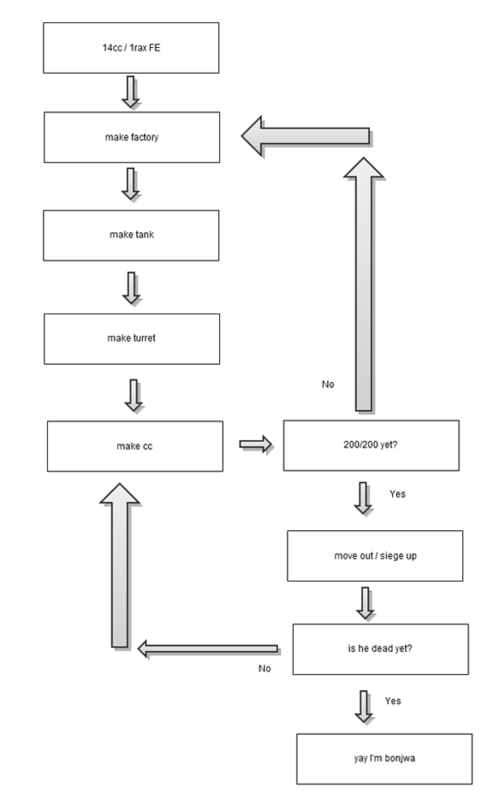 Fantasy assumes that Jangbi's plan is to expand, and doesn't get an engineering bay. Jangbi gets rid of the mines using a zealot and two dark templars arrive unannounced. Fantasy, with no detection, loses his tanks to dark templars. With no tanks, dragoons roll over his natural. Fantasy fights tooth and nail to defend his main, but Jangbi continues to stream in unit after unit. Fantasy sticks around, disappointed by his loss, but eventually concedes when his main is in ruins. Jangbi wins the final Brood War OSL 3-1. For Jangbi, it has been five long years in the world of e-sports. Joining Samsung KHAN in early 2007, he's had a bumpy ride to the top. Jangbi had an explosive appearance in the scene; in his first year after joining KHAN, Jangbi became one of the team's aces in the 2008 Shinhan Proleague, propelling them to victory over then favorite CJ Entus. Immediately after, he proceeded to make the finals of Clubday MSL, infamous for its PvPvPvP semifinals. Becoming one of the Six Dragons in an era dominated by Protoss players, Jangbi seemed like he was heading straight to the top. Now, all he needed was a title to prove that it was not Bisu or Stork who was the best Protoss, but Jangbi himself. However, after losing to Luxury in the Lost Saga MSL finals, Jangbi seemed to struggle. Between 2009 and 2011, Jangbi fell into a slump. In 2010, he managed a sub-50% winrate and a 14-loss streak. 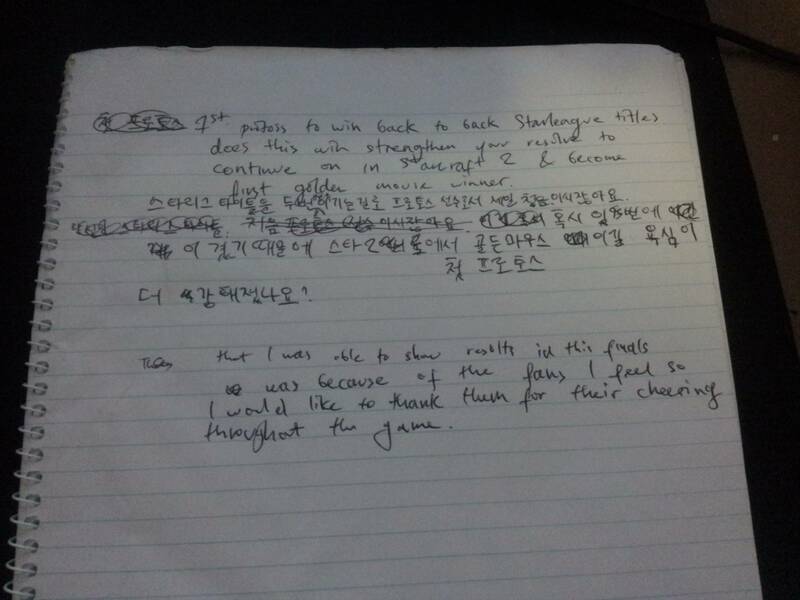 KHAN managed to continue to be relevant through players like Stork, great, and firebathero, but Jangbi the time when "Samsung's ace" conjured images of Jangbi was long past. Then, Jin Air OSL happened. The scene was perfect for Jangbi to rise. 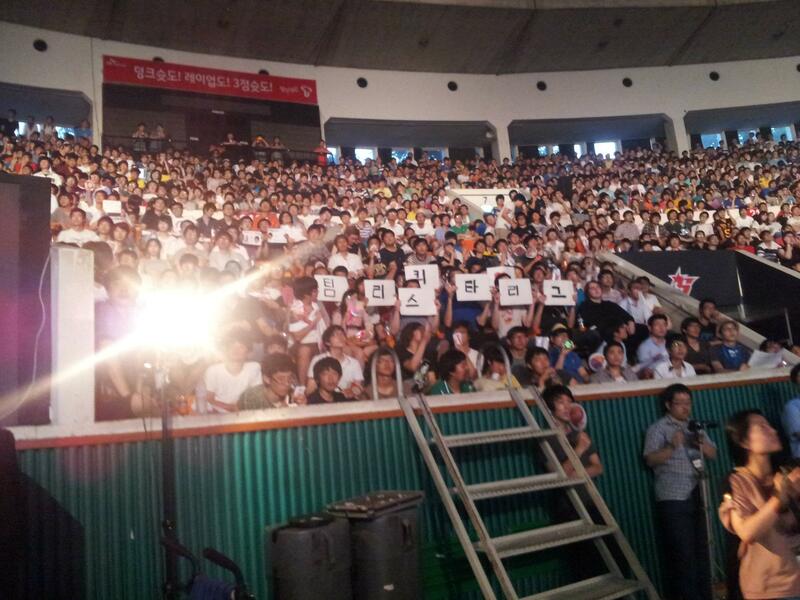 Brood War in Korea had begun its decline; people had accepted that Flash was God, and would be the best player forever. Fantasy had just destroyed Stork 3-0 in the last OSL. Autumn was approaching, and at some stage it seemed that Jangbi had decided he could no longer spend his time hiding behind Stork. This was his chance, perhaps his last chance, to prove that he was the best Brood War player. When he was down 0-1 to Flash, nobody could have expected him to make it to the semifinals. Then, in an electrifying series, Jangbi showed us why he is the best PvT player in the game to date. Storms were deployed according to knowledge that only Jangbi understands. Flash fanboys and fangirls the world over were stunned. Their God had lost to a member of the Kong line. What Flash fans didn't know is that, before there was God, there was the Huhneunim, the Almighty. After decimating SoO in the semifinals, Jangbi fought a close series against Fantasy, avenging his teammate Stork and achieving the Legend of the Fall for the last time. Had OSL ended here, the title of the best BW player at the end could possibly be still up for debate. Fantasy had almost won the finals, Flash was still recovering from surgery, etc. However, Jangbi was given another chance to solidify his position as the best. As we all know, Jangbi tore through the competition with a comeback win againt ZerO and a solid 3-1 victory over Fantasy. I don't think there are any doubts anymore in fans' minds. Jangbi won the two last major Brood War tournament against other champions. It's safe to say that Jangbi is The Last Champion. On these forums, I am known as an SKT fanboy, and rightly so, for what other team can one root for when it is the most celebrated and successful franchise in all of ESPORTS? However, I'm not here today to talk about their spectacular team league performance. Here, in this OSL piece, I'm going to talk about the OSL and SKT's Deadly Dynasty. If Boxer and Iloveoov invest in this new breed of Terran, and spend the hours, days and weeks needed to truly develop him into a player of their calibre, the world of Starcraft just may see another titan emerge in the seasons to come. In the months to follow, Boxer and oov do invest the time, and it pays off handsomely, with a blistering win over Jaedong in the final game of the 2008-09 Proleague finals. I watched that game live, and having watched many other games before and after it, I can safely say that it's the match that sums up Broodwar for me. The year was 2009, and Fantasy had come of age. He could play the macro game like oov, and if this particular match showed us anything, he could also pull out balls-to-the-wall plays like BoxeR. 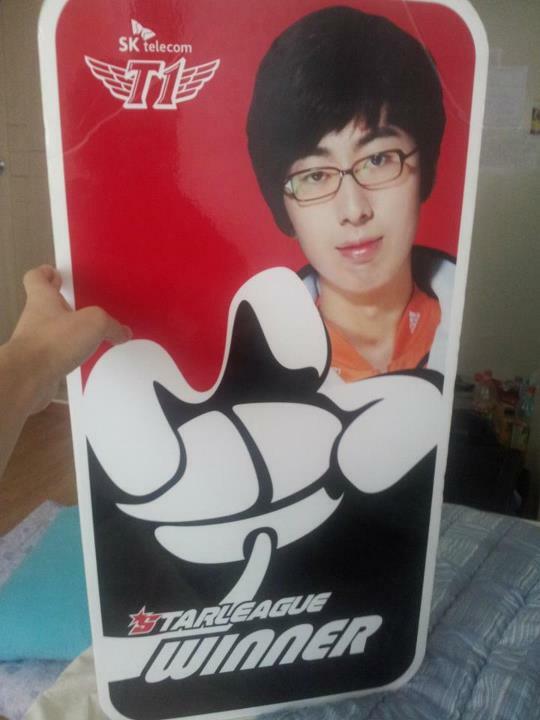 In other words, he was the whole package, the result of half a decade of Terran development at SK Telecom T1. And yet, as the seasons went on, Fantasy struggled. He had the skill, he had the determination, but the results never came. Though he won Bacchus 2010-2011, his OSL career comes to a close with four silvers. As an SKT fan, I don't count medals today (if only because it would take a while, seeing we have more than half of all the Proleague medals of all time). As a fan of the Deadly Dynasty, I look at their contribution to the game. BoxeR brought the Terran race out from behind its bunkers. iloveoov, alongside Midas, pioneered the 8rax if close - 14cc if far philosophy. Fantasy revolutionised Terran play with surgical use of the vulture and the valkyrie. Does Flash have more OSL golds than Fantasy? Sure he does. Does watching him play put me to sleep? Nearly always. It's fitting then, that in Broodwar's last hurrah, Flash's mind-numbingly boring 14cc into Zzz style of play came up against The Terrorist's cool and efficient TvT, and lost. Yes, Flash lost, and the excuses flowed. He was focusing on SC2, he was out of form, he didn't have enough Pokari Sweat, his keyboard was off by 5cm. I'm not here to make excuses for Fantasy's OSL performance; he was a player capable of far better results, yet he never posted them. This OSL could have been Fantasy's. Even though it was the fall, those games could have been his. Jangbi outplayed him, and deserves full credit for it. He was, and always will be one of my favourite Protosses. I'm not here to talk about Jangbi. I'm here to reiterate something that we all already know; Fantasy is one of the great Broodwar Terrans, and we will remember him not just because he had a fantastic run in the last ever OSL, and not just because his win percentage in his final season was nothing short of ridiculous. We will remember him because he was there to represent Broodwar's greatest dynasty when the game breathed its last. Lim Yo Hwan, Choi Yun Sung, Jung Myung Hoon. The Emperor, The Cheater, The Terrorist. Between them, they have six OSL golds and seven OSL silvers. Between them, they pioneered three unique styles of play that changed their race, and indeed their game, forever. Between them, they begat, nurtured and saw the beautiful game to its end. They will be remembered, and for much more than medals. 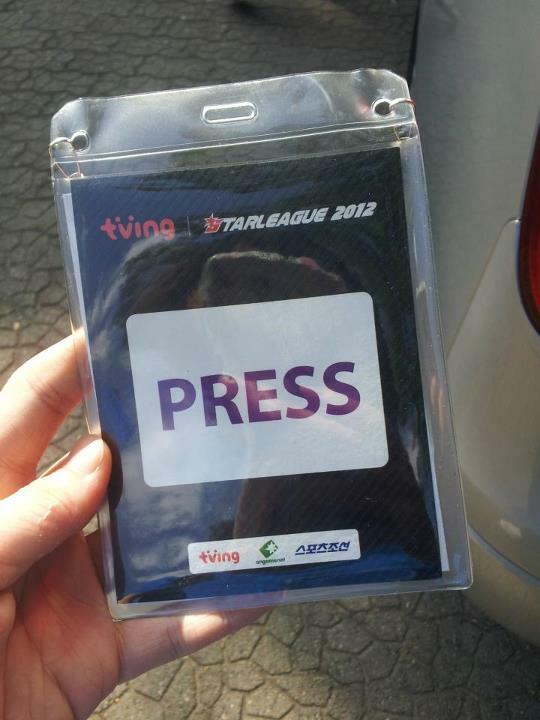 I was allowed to watch the Tving OSL finals from the press area (thanks to supernovamaniac for hooking myself, kjwcj and JSy up with access). Here is my story of what happened on the 4th of August, 2012. 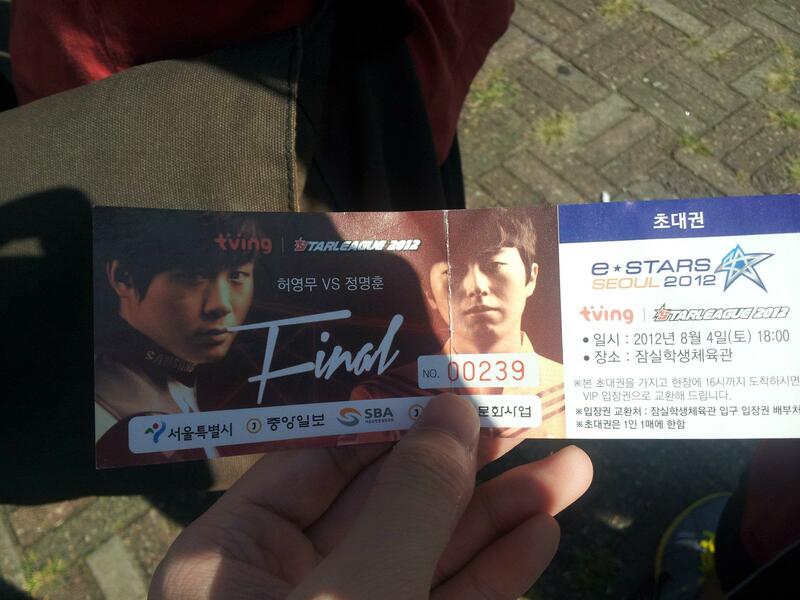 After getting around three hours' sleep due to a hectic night, I woke up at 7am, ready to receive my ticket outside the Jamsil Student's Gymnasium (serving as venue for the OSL final). We figured that, even though I had a VIP ticket already, the first ones there would get the best seats. After waiting for kjwcj to come back home from an all-night PC Bang session, we travelled by cab all the way to Jamsil. It was among the most excruciating taxi rides I've ever taken; lack of sleep combined with travelling pretty much from one area of Seoul (Hongdae) to the other side of the city. On arrival, we were approached by this. Hundreds, if not thousands, of people wanting to watch the last Brood War final, lining up at 8 in the morning just for tickets. It was breathtaking. Here is a video I recorded documenting the line. Sorry for the verticality, tilt your head! We joined the VIP queue to get our tickets. It didn't help that we were tired and it was almost 40 degrees Celsius. I'm surprised I didn't end up with heat stroke by the end of it. Fortunately I had a bottle of Pocari Sweat with me. 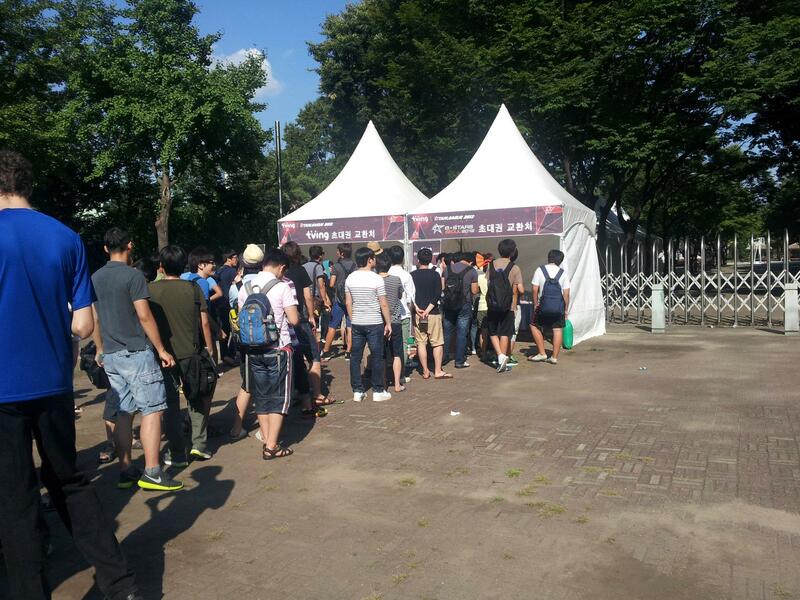 Around half an hour later, the line started to move; people were finally redeeming their VIP tickets for the real tickets. It was time to say good bye to the precious article that had been spent the last week taking up prime wallet space. After redeeming my ticket (anecdote: the girl who gave me the ticket was really cute and spoke perfect English; surprised the hell out of me), myself, supernovamaniac, and a couple of other people decided to head to Yongsan for the two Proleague games before the OSL final. As for kjwcj and the others who had gone PC Banging, they went back home to sleep. 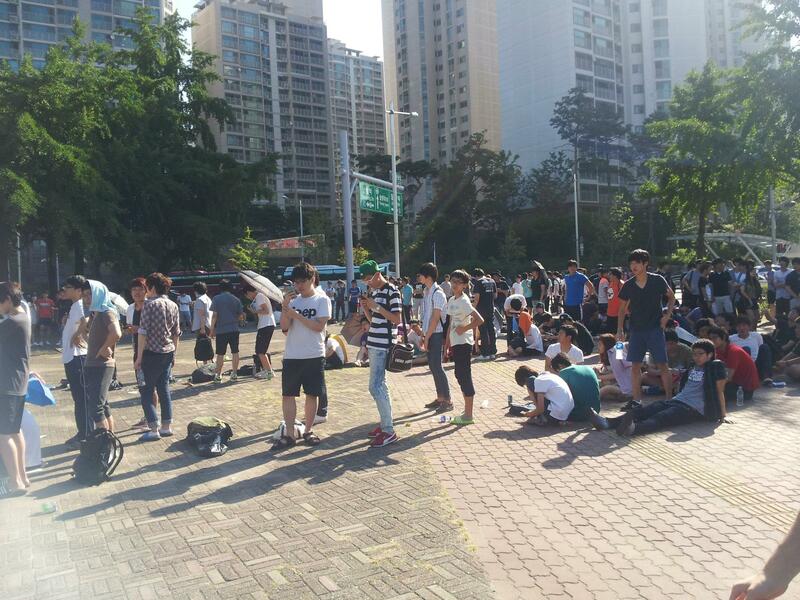 We got back to Jamsil at around 4:30pm, and we did not expect an even BIGGER line. 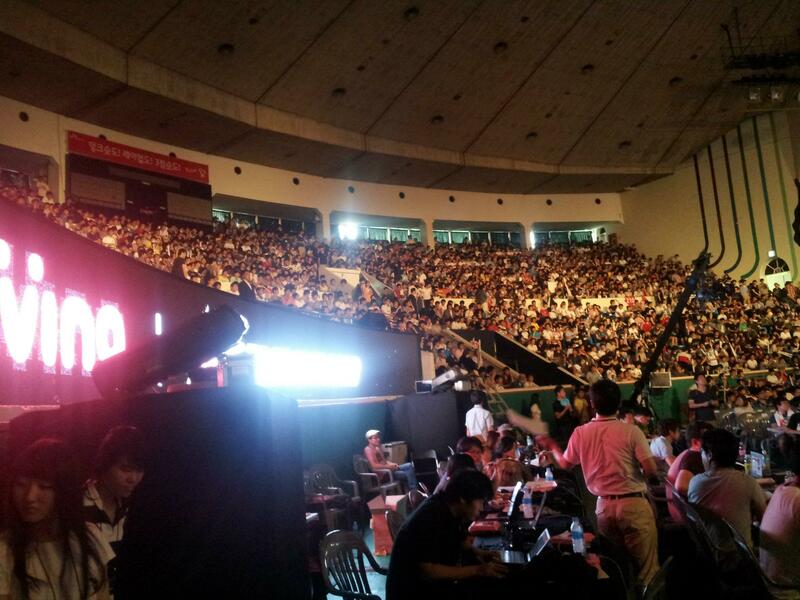 Thankfully they were all divided into VIP/non-VIP/just arrived sections. Moreover, the heat was worse than it had been in the morning, it was worse than an Australian summer. Then supernovamaniac arrived with our press passes. We quickly headed into the gymnasium, which was actually a block or so away from where people lined up. Before I left though, I managed to catch the line starting to move. Here is what happened. Good grief. Myself, kjwcj, and JSy (photographer) made our way to the gymnasium and the subsequent press area. Taking advantage of the uncrowded area, I took some snap shots of the set-up. Meanwhile, I'd help direct JSy on what to photograph, as well as co-ordinate the Teamliquid <3's Starleague cheerful. During the night, I would alternate between the press area and a row of seats a group of Teamliquid people were sitting at. Here are some photos from the press area looking on to the crowd, and the group of TLers with their sign. 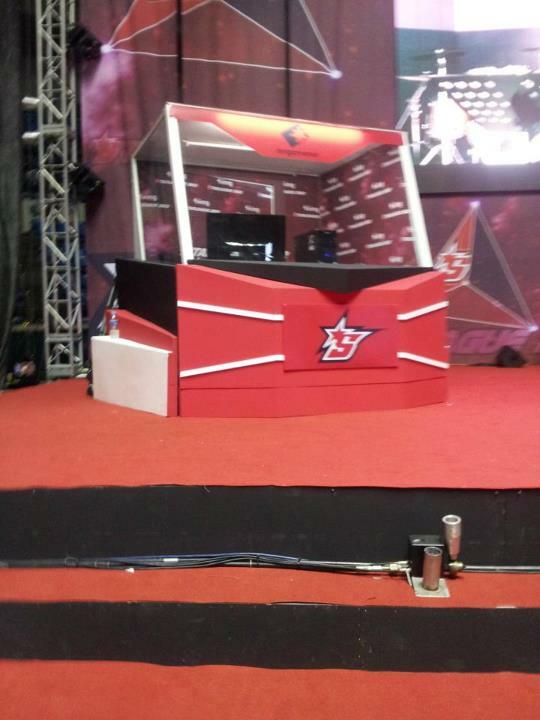 Here is the press area we had to work with. Nice view of the stage as well. Once the games started, the stadium rumbled. Never in my life I felt so much hype. No amount of nerd chills could describe the sense of glee. For reports of the games, please read l10f's write-up. Oh, by the way, though it didn't make it to the stream, Bunkie and his sidekick danced to Gangnam Style. The games ended with an euphoric 3-1 victory for the Almighty Protoss. Sitting in the press area watching the closing ceremony, I couldn't help but notice two Fantasy fangirls crying (and I mean really crying). I don't know if they were crying because it was the end of the last Brood War Starleague, or because their player lost. After the closing ceremony, we were able to participate in the press interview with Jangbi. We actually managed to get a question in! I'd like to thank Kwon who helped us out with the translation (as supernovamaniac went home and JSy was still busy taking photos). Here are the notes for the translation and notes from the games (which I was going to use for the recap... but alas never used). As the night ended, players, staff and fans started leaving. As a fervent fan who had flown from Australia for this occasion, there was nothing wrong with staying behind a while to acquire some souvenirs to take home, right? Yes, that Fantasy cardboard piece is sitting next to me. Leaving the venue, I'd run into Sea[Shield], who attended the finals with Saint[z-zone]. I'm amazed he recognized me first and greeted us. To you, Bosung, cheers. Before my final words, some shout-outs to a few people; kjwcj for being my travel buddy in Korea, JSy for being an awesome photographer and our translator at media day - also without him recognising me in my Teamliquid shirt at the OSL semi-final, we wouldn't have had gotten into the stadium. MrHoon for showing us around Seoul and taking good care of us, supernovamaniac for hooking us up with press access for both the OSL qualifier and OSL finals, FoX for loaning us his laptop for the OSL final, iykguil for translating at the press interview for Jangbi and the various people I met along my journey in Korea (Stebus, Dansickle, XeqtR, Galkatar, Vladinak, rainei, Holgerius, Rekrul, Drakke, Catfud, Slog, Pokebunny, Sharon, Nils and his girlfriend, Moletrap, FuRong, masterbreti). If I forgot you, I'm sorry! Please post if I did meet up with you but did not name you. After heading into a fried chicken place, the clock ticked over past midnight, ending one of the greatest and saddest nights of my life, that cardboard Fantasy is the glass slipper of our OSL, a sweet reassurance that it happened at all. 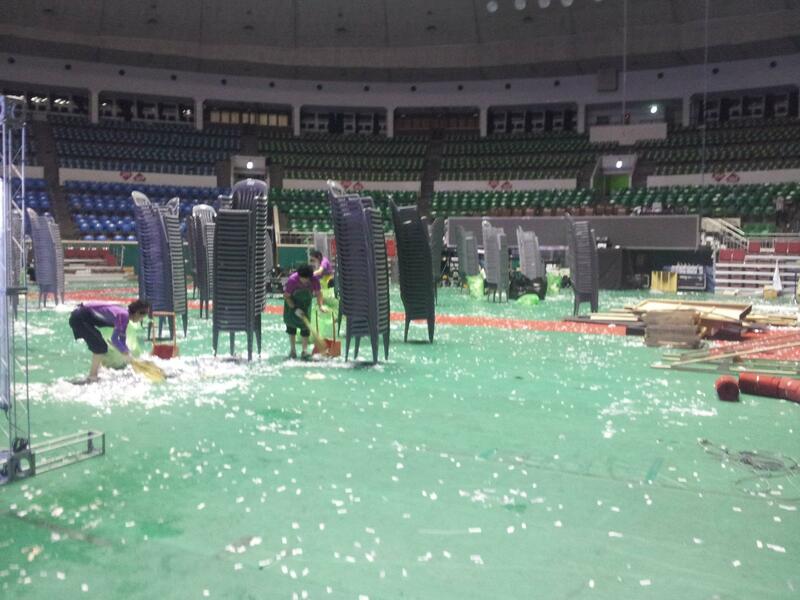 My final sight of the OnGameNet Starleague, a bunch of ahjumma's cleaning up the gymnasium. Thank you for following the Tving OSL. 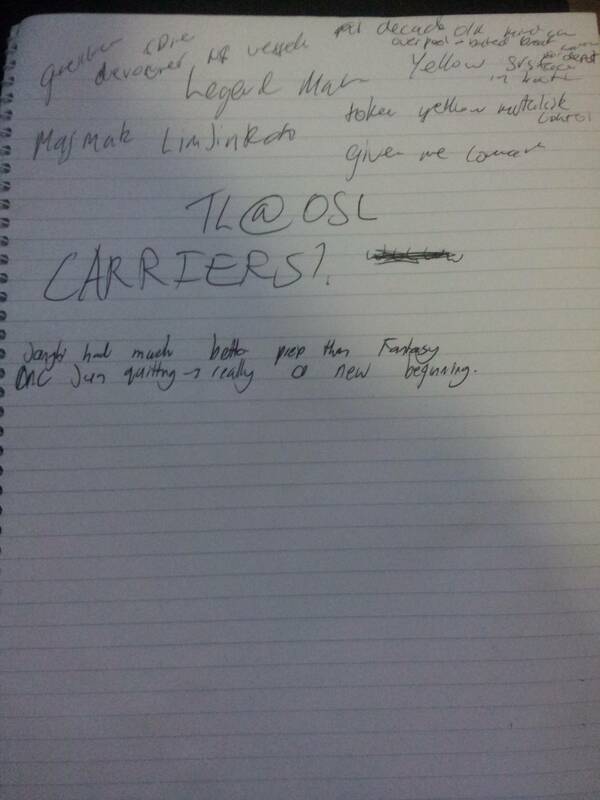 This writeup was brought to you by the Team Liquid OSL Team 2012 - riptide, l10f, Silversky, 2Pacalypse-, kjwcj and SirJolt. Thank you for GTR for the guest column! Goodbye, Broodwar. Thank you for everything. It's been wild, but if Brood War is dead its ghost is acting mighty lively. Went through a lot of life always having BW going on in the background. Feel so strange for it to have finally passed. Always have a place in my heart. Awesome Broodwars on it's last day. I'll never forget how BW shaped my teenage self . We'll get BW back into cable television. Soon. And again, tears in my eyes. 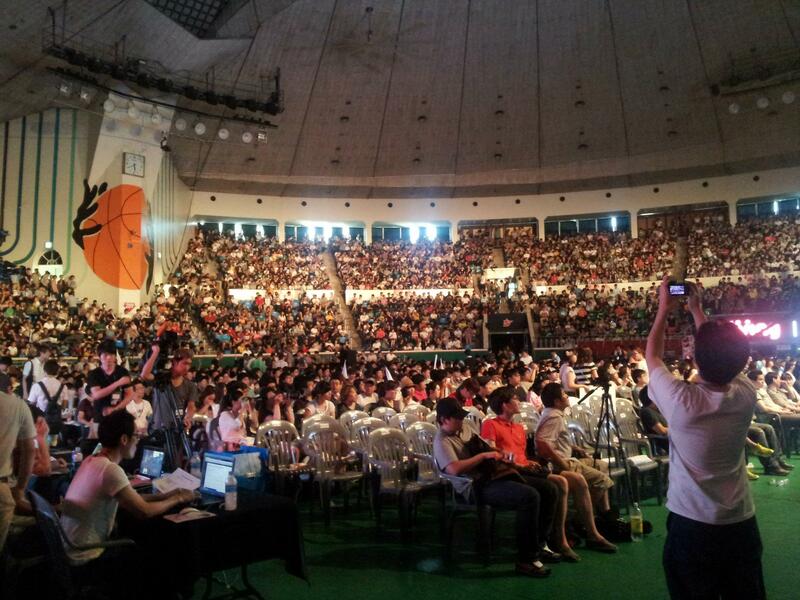 Was a wonderful finals though, it really hit the spot it needed as the final broodwar Starleague. "No amout of macro will make marines beat banelings"